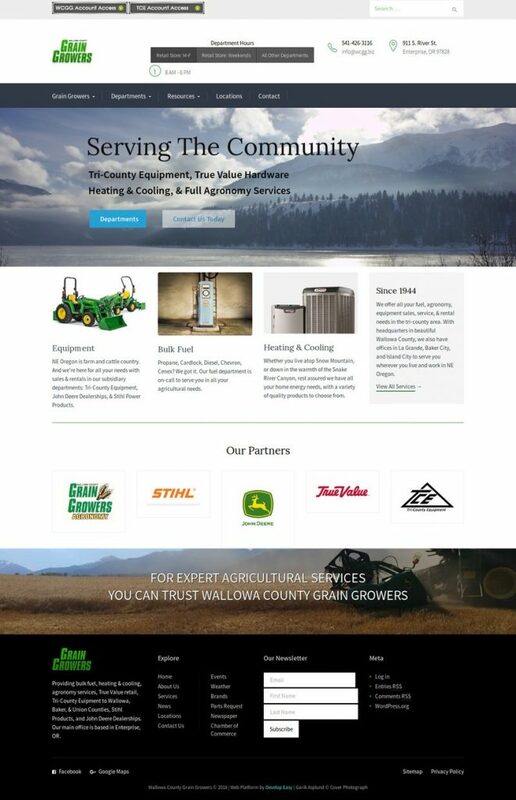 An in-depth business platform for our friends at Wallowa County Grain Growers – the parent organization of Tri-County Equipment and True Value, serving Baker, Union, & Wallowa County. “The Middle Way” between visual and encyclopedic format showing an agricultural emphasis with the many tiers of services that Grain Growers provides the NE Oregon Ag. community. Externally integrated links with Account Access for WCGG & TCE. Information & contact forms available for all 7 business departments, including in-depth fields for ordering parts for your mechanical gear through Tri-County Equipment. iFrame embeds for local weather and events in our Resources tab.